And those words must have reminded me of the first line of Apple’s iconic “Think Different” advertising campaign (“Here’s to the crazy ones…”) because all of a sudden I was imagining what it would have sounded like if Steve Jobs had translated the Beatitudes. If we imagine the Sermon on the Mount as the constitution for the Kingdom of God, the Beatitudes are its world-inverting preamble. Instead of trying to win favor with the religious, political, and moneyed elites, Jesus blesses the poor in spirit, the pure in heart, the grieving, the meek, the merciful, the peacemakers, and the persecuted. For some reason, the most vocal Christians among us never mention the Beatitudes (Matthew 5). But, often with tears in their eyes, they demand that the Ten Commandments be posted in public buildings. And of course, that’s Moses, not Jesus. I haven’t heard one of them demand that the Sermon on the Mount, the Beatitudes, be posted anywhere. If Steve Jobs had a created a campaign for the Beatitudes, I imagine it would feature images of people like Romero, Dorothy Day, Martin Luther King, Jr. Mother Teresa, and other heroes of the faith who were “crazy” enough to follow hard after Jesus. I don’t know, maybe it should even include Kurt Vonnegut, who, even though he could never fully accept Jesus’s divinity, still let Jesus change his heart in ways that challenge me as a Christian. I think of this as the “Live Different” campaign. The image below has my preferred formatting. Below that you’ll find the plain text version. 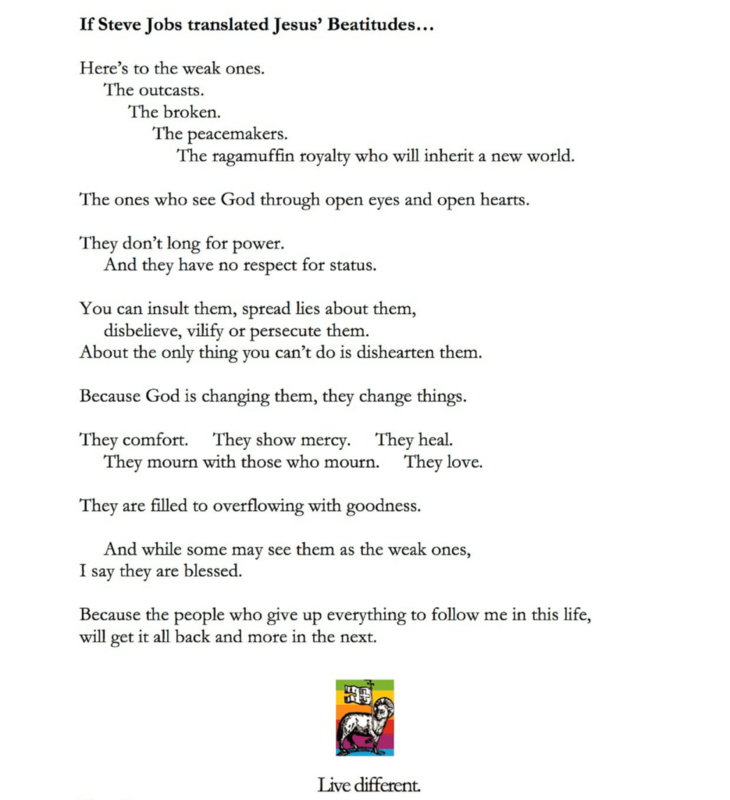 Here’s to the weak ones. The ragamuffin royalty who will inherit a new world. The ones who see God through open eyes and open hearts. They don’t long for power. And they have no respect for status. disbelieve, vilify or persecute them. About the only thing you can’t do is dishearten them. Because God is changing them, they change things. They comfort. They show mercy. They heal. They mourn with those who mourn. They love. They are filled to overflowing with goodness. I say they are blessed. will get it all back and more in the next.